By 1560, Calvinism and Catholicism had become highly militant (combative) religions. They both wanted to win converts and to eliminate the other's authority. This was the main cause of the religious wars in Europe in the sixteenth century, but economic, social, and political forces also played important roles. The French Wars of Religion lasted from 1562 to 1598. The French kings persecuted Protestants, but the persecution did not stop the spread of Protestantism. French Protestants who were influenced by John Calvin were called Huguenots. The Huguenots made up only about 7 percent of the total French population, but 40 to 50 percent of the nobility were Huguenots. The conversion of so many nobles made the Huguenots a threat to the French monarchy, which was strongly Catholic. An extreme Catholic party also strongly opposed the Huguenots. They were known as the ultra-Catholics. They were able to recruit and pay for large armies. Although the main issue in the French wars was religion, other factors also played a role. Many towns and provinces had long resisted the power of French monarchy. They were willing to assist the Huguenot nobles in weakening the monarchy. For 30 years, there were battles in France between the Catholics and Huguenots. Finally in 1589, Henry of Navarre became king of France. As king, his name was Henry IV. He was the political leader of the Huguenots and a member of the Bourbon dynasty. He realized that he would never be accepted as king by most of Catholic France, so he converted to Catholicism. To solve the religious problem, he issued the Edict of Nantes in 1598. The edict recognized Catholicism as the official religion of France, but it gave Huguenots the right to worship. It also gave them full political rights. 1. Who were the Huguenots? Huguenot? Did you mean Astronaut? Nope! The greatest supporter of militant Catholicism in the second half of the sixteenth century was King Philip II of Spain. He reigned from 1556 to 1598. His first major goal as king was to consolidate the lands he had inherited from his father, Charles V. These included Spain, the Netherlands, and possessions in Italy and the Americas. To strengthen his control, he insisted on strict conformity to Catholicism and strong monarchical authority. The Catholic faith was important to both Philip II and the Spanish people. Spain saw itself as a nation of people chosen by God to save Catholic Christianity from the Protestant heretics. Philip II became a champion of Catholic causes. He led a Holy League against the Turks. This resulted in a victory over the Turkish fleet in the Battle of Lepanto in 1571. He was not as successful in the Netherlands. The Spanish Netherlands consisted of 17 provinces (modern Netherlands and Belgium). It was one of the richest parts of Philip's empire. Philip tried to strengthen his control in this region. The nobles of the Netherlands strongly opposed him. Philip also tried to crush Calvinism in the Netherlands. Violence broke out in 1566 when Calvinists began to destroy statues in Catholic churches. Philip sent ten thousand troops to crush the rebellion. In the northern provinces, the Dutch, under the leadership of William the Silent, offered growing resistance. Finally, in 1609, a 12-year truce ended the war. The northern provinces began to call themselves the United Provinces of the Netherlands. They became the core of the modern Dutch state. The seventeenth century has been called the golden age of the Dutch Republic. Philip's reign ended in 1598. At that time, Spain was the most populous empire in the world. It controlled almost all of South America and a number of settlements in Asia and Africa. To most Europeans, it seemed to be the greatest power at the time. However, its treasury was empty. Philip II had gone bankrupt from spending too much on war. The armed forces were out-of-date, and the government was inefficient. Spain continued to play the role of a great power, but real power had shifted to England. 2. Why is Philip II called the Most Catholic King? During the reign of Elizabeth Tudor, England became the leader of the Protestant nations of Europe and laid the foundations for a world empire. Elizabeth became queen in 1558. To solve the religious problem in England, she repealed the laws favoring Catholics that had been passed under her Catholic half-sister, Mary Tudor. A new Act of Supremacy named Elizabeth as the "only supreme governor" of both church and state. The Church of England under Elizabeth was basically Protestant, but it followed a moderate Protestantism that kept most people satisfied. Elizabeth tried to keep Spain and France from becoming too powerful by balancing power. If one nation seemed to be getting more powerful, England would support the weaker nation. Philip II of Spain wanted to invade England, partly to overthrow Protestantism. His advisers told him that the people of England would rise against Elizabeth when the Spaniards arrived. In 1588, Philip ordered preparations for an armada (a fleet of warships) to invade England. But the Spanish were no match for the English. After a number of battles, the Spanish armada sailed back to Spain by a northern route around Scotland and Ireland. The ships were pounded by storms, and many sank. 3. How did Elizabeth solve the religious problem in England? From 1560 to 1650, Europe had severe economic and social crises. One major economic problem was inflation, or rising prices. The influx of gold and silver from the Americas was one cause of the inflation. There was also a growing population in the sixteenth century. This increased the demand for land and food and drove up prices for both. Spain's economy was seriously failing by the 1640s. It had grown dependent on imported silver, and the silver mines were producing less silver. Italy was the financial center of Europe in the Renaissance, but it was also declining economically. The population in Europe increased from about 60 million in 1500 to 85 million by 1600. By 1620, the population began to level off. By 1650, it began to decline, especially in central and southern Europe. Warfare, plague, and famine all contributed to the population decline. 4. What were some of the causes of inflation in the sixteenth and early seventeenth centuries? A belief in witchcraft, or magic, had been part of traditional village culture for centuries. During the sixteenth and seventeenth centuries, an intense hysteria about witchcraft affected the lives of many Europeans. More than a hundred thousand people were charged with witchcraft. As more and more people were brought to trial, the fear of witches grew. So did the fear of being accused of witchcraft. Poor, common people were the ones most often accused. More than 75 percent of those accused were women. Most of them were single or widowed and over 50 years old. Under torture, accused witches usually confessed. By 1650, the witchcraft hysteria had begun to lessen. Officials were less willing to disrupt their societies with witch trials. People were also less willing to believe in the old view of a world haunted by evil spirits. 5. Which people were most likely to be accused of witchcraft? Religious disputes continued in Germany after the Peace of Augsburg in 1555. One reason for the disputes was that Calvinism had not been recognized by the peace settlement. Religion played an important role in the start of the Thirty Years' War, but there were also political and territorial motives for this war. The war began in 1618. At first, it was a struggle between Catholic forces and Protestant nobles in Bohemia. The Protestant nobles were primarily Calvinists who rebelled against the Hapsburg emperors. Soon the conflict became a political one. Denmark, Sweden, France, and Spain all entered the war. The war became a struggle between France and the rulers of Spain and the Holy Roman Empire. Most of the battles of the war were fought on German soil. For 30 years, Germany was plundered and destroyed. The Peace of Westphalia ended the war in 1648. It stated that all German states, including the Calvinist ones, could determine their own religion. The states that had made up the Holy Roman Empire were recognized as independent states. This brought an end to the Holy Roman Empire. Germany would not be united again for another two hundred years. France, on the other hand, emerged from the war as the dominant nation in Europe. 6. What was the impact of the Thirty Years' War on Germany and France? The civil war in England is known as the English Revolution. It began as a struggle between the king and Parliament to determine what role each should play in governing England. After Queen Elizabeth died in 1603, the Tudor dynasty came to an end. The Stuart line of rulers began when Elizabeth's cousin, the King of Scotland, became James I of England. He ruled from 1603 to 1625. James believed in the divine right of kings (that kings receive their power from God and are responsible only to God). Parliament, on the other hand, believed that the king or queen and Parliament ruled England together. Religion was also an issue. The Puritans (Protestants in England inspired by Calvinist ideas) did not like the king's strong defense of the Church of England. The Puritans were part of the Church of England, but they wanted to make it more Protestant. Many of England's wealthy landowners had become Puritans. These Puritans were an important part of the House of Commons, the lower house of Parliament. The conflict began during the reign of James but came to a head during the reign of his son, Charles I. Charles ruled from 1625 to 1649. In 1628, Parliament passed a petition that prohibited the passing of any taxes without Parliament's consent. At first, Charles I accepted this petition, but he later changed his mind, because the petition put limits on the king's power. Charles also tried to impose more ritual on the Church of England. To the Puritans, this was a return to Catholic practices. When Charles tried to force them to accept his religious policies, thousands of Puritans went to America. This is an example of how religious struggles in England influenced American history. In 1642, a civil war began between the supporters of the king (the Cavaliers or Royalists) and the parliamentary forces (called the Roundheads because of their short hair). Parliament was victorious. This was due mainly to the New Model Army of Oliver Cromwell. This army was made up primarily of extreme Puritans who believed that they were doing battle for God. After the victory, Cromwell purged Parliament of any members who had not supported him. What was left of the Parliament is known as the Rump Parliament. The Rump Parliament had Charles I executed on January 30, 1649. Parliament then abolished the monarchy and the House of Lords and declared England a republic, or commonwealth. Cromwell dispersed the Rump Parliament if by force. Cromwell then set up a military dictatorship. Cromwell ruled from 1653 until he died in 1658. In 1660, Parliament made Charles II king. He was the son of Charles I. He ruled until his death in 1685. Parliament passed laws that made the Church of England the state religion again. The laws also took away some rights of Catholics and Puritans. Charles II was sympathetic to Catholicism. He suspended the laws that Parliament had passed, but Parliament forced him to back down. In 1685, James II, the brother of Charles II, became king. He was an open and devout Catholic. He named Catholics to high positions in the government and military. In 1688, a group of English noblemen invited the Dutch leader, William of Orange, to invade England. William of Orange was the husband of James' daughter, Mary. William and Mary were Protestants. They raised an army and "invaded" England. James fled to France. With almost no bloodshed, England had undergone a "Glorious Revolution". In January 1689, Parliament offered the throne to William and Mary. They accepted it, along with a Bill of Rights. The Bill of Rights set forth Parliament�s right to make laws and levy taxes. It also stated that standing armies could only be raised with Parliament's consent. The rights of citizens to keep arms and have a jury trial were also confirmed. The bill laid the foundation for a limited, or constitutional, monarchy. Another important action of Parliament was the Toleration Act of 1689. This act granted Puritans, but not Catholics, the right of free public worship. Few English citizens would ever again be persecuted for religion. By deposing one king and establishing another, Parliament destroyed the divine-right theory. William was king, not by the grace of God, but by the grace of Parliament. 7. What was the "Glorious Revolution" in England? 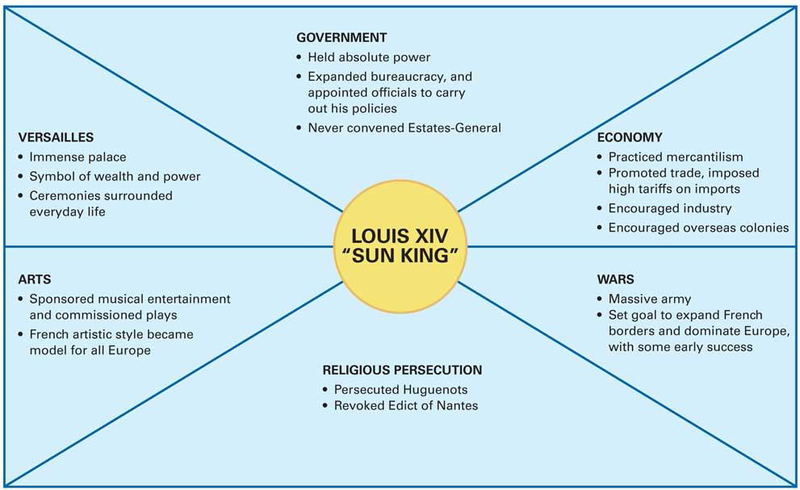 The reign of Louis XIV has been regarded as the best example of the practice of absolutism in the seventeenth century. Absolutism is a system in which a ruler holds total power. In seventeenth-century Europe, absolutism was tied to the idea of the divine right of kings. Absolute monarchs had tremendous powers. They had the ability to make laws, levy taxes, administer justice, control the state's officials, and determine foreign policy. French history for the 50 years before Louis was a period of struggle. Both Louis XIII and Louis XIV were only boys when they became kings. Royal ministers controlled the government. Cardinal Richelieu, Louis XIII�s chief minister, strengthened the power of the monarchy. Because the Huguenots were seen as a threat to the king�s power, Richelieu took away their political and military rights. He also set up a network of spies to uncover plots by nobles against the government. When plots were discovered, he executed the conspirators. Louis XIV came to the throne in 1643 at the age of four. Due to the king's young age, Cardinal Mazarin, the chief minister, took control of the government. During the time of Mazarin, there was a revolt led by nobles who were unhappy with the growing power of the monarchy, but the revolt was crushed. When Mazarin died in 1661, Louis XIV, now age 23, took over supreme power. He had complete authority over foreign policy, the Church, and taxes. He created a myth of himself as the Sun King, the source of light for all of his people. Louis set up his royal court at Versailles. His court served three purposes. It was the personal household of the king. The chief offices of the state were located there, so Louis could watch over them. It was also the place where people came to find favors and offices for themselves. The royal council was the king�s chief administrative body. To keep nobles and royal princes from becoming too powerful, Louis removed them from the royal council. At the same time, he invited them to court, where he could keep them busy with court life and out of politics. At the local level, however, Louis's power was limited. The nobles, local officials, and town councils had more influence than the king in the day-to-day operations of the local governments. As a result, the king bribed people in the provinces to see that his policies were carried out. Louis had an anti-Protestant policy. He ordered the destruction of Huguenot churches and closed their schools. As many as two hundred thousand Huguenots left France for England, the United Provinces, and the German states. Louis developed a standing army of four hundred thousand. He waged four wars between 1667 and 1713. His ambitions caused many nations to form coalitions against him. Through his wars, Louis added some territory to France�s northeastern frontier and set up a member of his own family on the throne of Spain. The cost of pursuing wars, building palaces, and maintaining his court made finances a crucial issue for Louis XIV. His controller-general of finances was Jean-Baptiste Colbert. Colbert followed the ideas of mercantilism. To decrease imports, he raised tariffs (taxes) on foreign goods. He also created a merchant marine to carry French goods. Nonetheless, when Louis XIV died in 1715, he left France with great debts and surrounded by enemies. After the Thirty Years' War, there was no German state, but over three hundred Germanies. Two of these states, Prussia and Austria, became great powers in the seventeenth and eighteenth centuries. Frederick William the Great Elector laid the foundation for the Prussian state. He built a large and efficient standing army. To maintain the army and his own power, Frederick William set up the General War Commissariat to levy taxes for the army and oversee its growth. The Commissariat soon became an agency for civil government as well. Many of its officials were members of the Prussian aristocracy, known as the Junkers. They also served as officers in the army. In 1701, Frederick William's son officially gained the title of king. Elector Frederick III became King Frederick I.
Europe. The core of the new Austrian Empire was the traditional Austrian lands in present-day Austria, the Czech Republic, and Hungary. After the defeat of the Turks in 1687, Austria took control of all of Hungary, Transylvania, Croatia, and Slavonia. By the beginning of the eighteenth century, the Austrian Hapsburgs had a new empire, but it never became a highly centralized, absolutist state. This was chiefly because it was made up of so many different national groups. Each of these areas had its own laws and political life. No common sentiment tied the regions together. 9. How was the Austrian Empire of the seventeenth and eighteenth centuries different from the old Hapsburg Empire? In the sixteenth century, Ivan IV became the first ruler to take the title of czar, the Russian word for caesar. Ivan expanded the territories of Russia eastward. He also crushed the power of the Russian nobility, known as the boyars. He was known as Ivan the Terrible because of his ruthless deeds. When Ivan's dynasty came to an end in 1598, a period of anarchy known as the Time of Troubles followed. This period did not end until the Zemsky Sobor, or national assembly, chose Michael Romanov as the new czar in 1613. The Romanov dynasty lasted until 1917. One of its most prominent members was Peter the Great. Peter became czar in 1689. He was an absolutist monarch who claimed the divine right to rule. A few years after becoming czar, Peter made a trip to the West. When he returned to Russia, he was determined to westernize Russia. He borrowed European technology, especially for the military. Under Peter the Great, Russia became a great military power. One of his first goals was to reorganize the army. He employed both Russians and Europeans as officers. He built a standing army of 210,000 men. He also formed the first Russian navy. After his trip to the West, Peter introduced Western customs, practices, and manners into Russia. He ordered the preparation of the first Russian book of etiquette to teach Western manners. Because Westerners did not wear beards or long coats, Russian beards had to be shaved and coats shortened. Because Western women mixed freely with men, Peter insisted that Russian upper-class women remove the veils that had traditionally covered their faces and move out into society. Peter also held gatherings in which both sexes could mix for conversation and dancing, a practice he had learned in the West. Peter also wanted to open a window to the West, an ice-free port with year-round access to Europe. This could only be achieved on the Baltic Sea. At that time, however, the Baltic coast was controlled by Sweden. Peter fought a long war with Sweden and finally acquired the lands he needed. In 1703, Peter began the construction of a new city, St. Petersburg, on the Baltic Sea. St. Petersburg was finished during his lifetime and became the Russian capital until 1918. 10. How did Peter's trip to the West change Russia? Tsar or Czar? Where does the word come from? French history for the 50 years before Louis was a period of struggle. Both Louis XIII and Louis XIV were only boys when they became kings. Royal ministers controlled the government. Cardinal Richelieu, Louis XIII's chief minister, strengthened the power of the monarchy. Because the Huguenots were seen as a threat to the king's power, Richelieu took away their political and military rights. He also set up a network of spies to uncover plots by nobles against the government. When plots were discovered, he executed the conspirators. Louis XIV came to the throne in 1643 at the age of four. Due to the king's young age, Cardinal Mazarin, the chief minister, took control of the government. During the time of Mazarin, there was a revolt led by nobles who were unhappy with the growing power of the monarchy, but the revolt was crushed. When Mazarin died in 1661, Louis XIV, now age 23, took over supreme power. He had complete authority over foreign policy, the Church, and taxes. He created a myth of himself as the Sun King, the source of light for all of his people. Louis set up his royal court at Versailles. His court served three purposes. It was the personal household of the king. The chief offices of the state were located there, so Louis could watch over them. It was also the place where people came to find favors and offices for themselves. The royal council was the king's chief administrative body. To keep nobles and royal princes from becoming too powerful, Louis removed them from the royal council. At the same time, he invited them to court, where he could keep them busy with court life and out of politics. At the local level, however, Louis's power was limited. The nobles, local officials, and town councils had more influence than the king in the day-to-day operations of the local governments. As a result, the king bribed people in the provinces to see that his policies were carried out. Louis had an anti-Protestant policy. He ordered the destruction of Huguenot churches and closed their schools. As many as two hundred thousand Huguenots left France for England, the United Provinces, and the German states. Louis developed a standing army of four hundred thousand. He waged four wars between 1667 and 1713. His ambitions caused many nations to form coalitions against him. Through his wars, Louis added some territory to France's northeastern frontier and set up a member of his own family on the throne of Spain. The cost of pursuing wars, building palaces, and maintaining his court made finances a crucial issue for Louis XIV. His controller-general of finances was Jean-Baptiste Colbert. Colbert followed the ideas of mercantilism. To decrease imports, he raised tariffs (taxes) on foreign goods. He also created a merchant marine to carry French goods. Nonetheless, when Louis XIV died in 1715, he left France with great debts and surrounded by enemies.